The Sustainable Office Program encourages CSUN to become more environmentally friendly. Top: Carlos Iglesias, Far left: Sanda Delgado, Mid left: Basille Jimenez, Mid right: Kyrsten Williams, Far right: Cynthia Signett. Photo courtesy of the Sustainable Office Program. 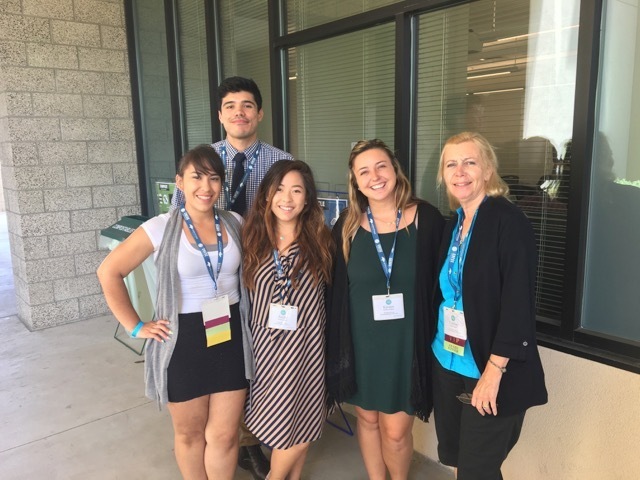 The Sustainable Office Program (SOP) at California State University, Northridge looks to increase participation in sustainability throughout the campus over the course of the 2017-18 academic year. Through checklists, the Mini Bin Program and their services, the SOP’s main goal is for sustainability to be a norm rather than a requirement. The SOP is a student-run initiative that aims to make offices at CSUN more environmentally friendly. The program contacts and assesses offices around campus to gauge how sustainable they are. These assessments allow the SOP to give recommendations that result in offices practicing sustainable habits that they weren’t aware of before. In addition, the program offers services from picking up bottles and cans to setting up blue bins for recycling in offices. The effect of this initiative results in a more environmentally friendly campus through the efforts of the SOP helping potentially more than 4,000 faculty members. Sanda Delgado will be the SOP lead when the fall 2017 semester begins and is looking forward to boosting participation from faculty during the next academic year. “Sustainability was always something in the back of my mind. My mom would always reuse sauce jars. Recycling bottles and cans was also a norm [in the family]. From what I know now, [there are a lot of] things that you can do that can really impact sustainability [in the community],” said Delgado. Before Associated Students (AS) took over the program in 2014, the SOP completed 32 assessments throughout the 2012-13 and 2013-14 academic years. With AS running the SOP, the program completed 79 assessments throughout the 2014-15 and 2015-16 academic years for an increase of 147 percent in two years. For the next academic year, on top of increasing participation, Delgado plans to gain a more statistical understanding of the program. In previous years, the SOP focused on trying to get the program to run smoothly. Now, the goal is to get more faculty and staff to participate through the use of information. These statistics will help the program measure which offices are acting in a more/less sustainable manner and also who should be contacted for an assessment. For assessing offices, the SOP uses two checklists to determine how sustainable an office is. The first is the mandatory prerequisite checklist, which should be practiced by all departments and staff. The requirements for this checklist can be done in a day and are quite simple. For example, “Do you use bins for paper recycling? If yes, do you have the proper signage?” and “Do you recycle cardboard through AS Recycling?,” are two items on the prerequisite checklist. After the prerequisite checklist is completed, the survey checklist is put into use which grades an office with a ranking of bronze, silver, gold or platinum. This checklist goes beyond the mandatory requirement on campus. In order to get a platinum grade, an office has to complete at least 90 percent of the checklist. Two examples of items on this checklist include, “Do you use CFL/LED task lighting to help reduce overhead lighting?” and “Do you encourage ride share in the department by sending out a sign-up?” After the assessment, the SOP gives recommendations to the office on how to improve sustainability. The Mini Bin Program is another project that runs within the SOP. The mini bins replace normal trash bins and allows staff to recycle in a time-efficient, “think before you toss,” manner. Once the mini bins are full, a member can empty out the recyclables into a central trash bin in the office. This allows CSUN to reduce the amount of trash sent to landfills in addition to saving costs on custodians, trash liners and funding through a waste contract. The SOP also educates offices throughout the campus by giving presentations on how to become more sustainable. The presentations give faculty and staff the opportunity to learn simple ways to increase sustainability such as unplugging a fan or using a central bin for trash. In addition, the SOP offers many services that offices can take advantage of such as picking up recyclable items from offices around campus, setting up a central land bin, providing information and referring offices to resources that they might not know about, such as the Physical Plant Management Services on campus. Carlos Iglesias, the Sustainable Office Program lead, has been working for AS Sustainability for four years and frequently contacts and assesses offices around campus. Iglesias says that many people are not aware of how easy it is for offices to be environmentally friendly. · Recycle cardboard, bottles, ink jets and cartridges. · Use battery recycle bins and mini bins. · Use a central trash bin rather than multiple trashcans. · Have a central refrigerator rather man multiple mini refrigerators. · Use recycled rather than virgin paper. · Avoid plug-in heaters and fans, which use a lot of electricity. · Turn off your lights at the end of the day.